On 15th March 2012, Econsultancy held the largest ever Digital Cream event at the Emirates Stadium in London, where senior client-side digital marketers came together in order to share best practice and learn from their peers. This year’s event included separate tables for B2B marketers, who often face different challenges when compared to their B2C counterparts. 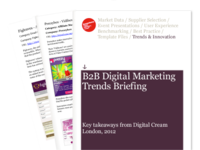 The feedback and commentary from both delegates and moderators has been used to create our B2B Digital Marketing Trends Briefing, which provides an insight into the challenges faced by digital B2B marketers. The report, which is free to download, provides highlights from 10 different roundtables at Digital Cream. As Digital Cream is conducted according to Chatham House Rules, marketers have spoken candidly about their issues. One issue that was highlighted on many tables was that digital techniques and practices have not been fully accepted across B2B businesses. B2B senior business managers tend to be older and more traditionally-minded, conservative and set in their ways. They have grown up throughout their successful careers with specialist trade magazines, brochures, direct mail, exhibitions and the sales force making ‘courtesy calls’. Many of the B2B digital specialists who attended felt outnumbered in their organisations. In some cases, they felt almost like pariahs even within the marketing department. There was a feeling that perhaps digital marketing was viewed as something of a poor relation within the marketing mix by those in senior management. Another challenge faced by B2B marketers was the potential for conflict arising between sales and marketing. For some organisations, these two units did not work together as well as would be hoped. On the customer relationship management (CRM) table, there was a feeling that although marketing ‘owned’ the data here, sales ‘owned’ the leads and customers. There was also a perception that sales teams did not work proactively to update CRM data, potentially leading to decreasing data quality. IT departments work on priorities. Marketing works on opportunities. Technology is never the barrier. People are the barrier. These two quotes came from a marketer that, having been given optimistic targets for revenue coming from online channels, found it difficult to implement the technical changes required in order to realise this goal. This was due to the internal culture of the team which managed IT within the organisation. However, it was not all negative comments coming from Digital Cream, with some demonstrating excellent successes in this space. Faced with the challenge of managing dispersed digital teams across the organisation, one marketer had won buy-in from senior management to create four key performance indicators (KPIs) across all digital business units. The customer doesn’t care about team structure. They want a unified experience. Are you a digital B2B marketer? Have you shared some of the same challenges listed above? Or do you think these are atypical of the experiences of digital specialists within the B2B space? Add your comments below and share your experiences. For more information, check out our B2B recommended reading to look at our most relevant reports. In our recently published B2B Digital Marketing Trends Briefing, we covered the highlights from 10 roundtables exclusively for B2B digital marketers. Two related tables were on lead scoring and nurturing (moderated by Bob Apollo) and marketing automation (moderated by Jay Kerr). The insights from both tables revealed that many B2B marketers did not know where to start with these disciplines, despite recognising their potential benefits. While at the SXSW 2012 Interactive Trade Show, we had a chance to tour the floor and meet with some of the companies on display. They offered a wide range of marketing solutions and gave us a few seconds of their time to give us their elevator pitch explaining just what they do.